When it comes to children’s decor, my eye is always drawn to white, airy rooms with playful details to add warmth and colour. Jenson’s gender neutral nursery is a perfect example of this, with his sweet ladybug bedding and special wooden toys out on display. There’s space to let him play unrestricted, with stylish storage boxes to tidy away any clutter afterwards. It’s also a room that can easily grow with him for years to come. Whilst monochrome is the trend of the moment, it can be surprisingly tricky to get right. The key is to find a balance and you can do this by adding in more soft tones and textures such as wooden accents, a fun wallpaper or contrasting prints. Not only does it make the space more interesting, but it doesn’t restrict you to one overly coordinated look. 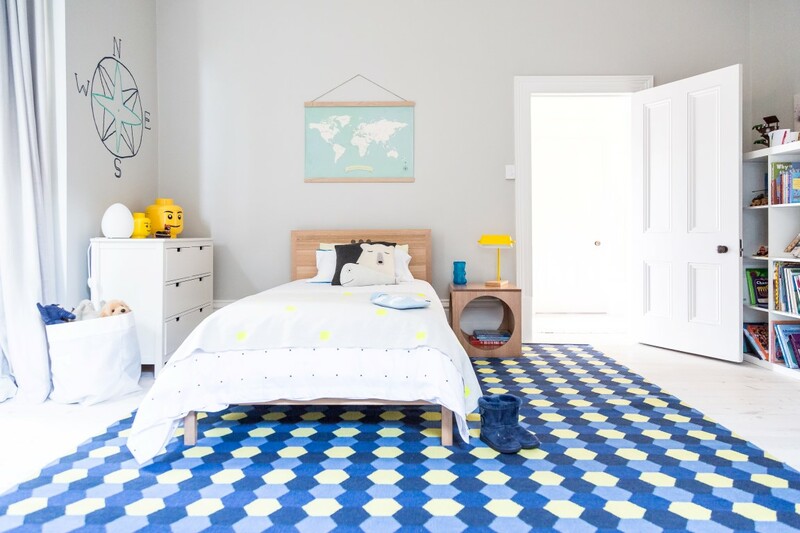 Have fun with styling and sourcing your key pieces and it will shine through in your child’s room! 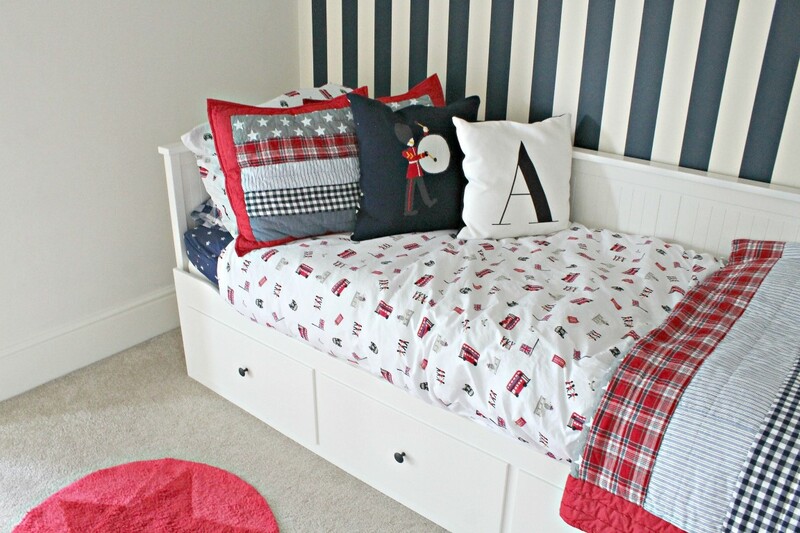 I love the calming and clean atmosphere this space has, which I think is really important for a child’s room. 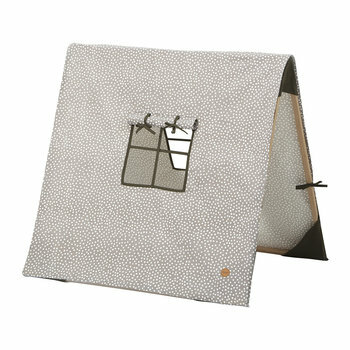 As a Mid Century design geek I love the simple wooden mobile hanging above the cot, the print of the wolf cub matches the earthy tones of the wood and cushion perfectly. I also love the idea of having photography of baby animals in a kid’s room, its just the right amount of cuteness whilst still feeling a little grown up. I’m a big fan of Middle eastern textiles and I really like the slight juxtaposition of the candy coloured persian rug and monochrome block printed throw. I chose this image as it has a great balance of mature style with cute elements and I think a room like this could be easily adapted as the child grows up. I love so much about this baby/toddler room interior. 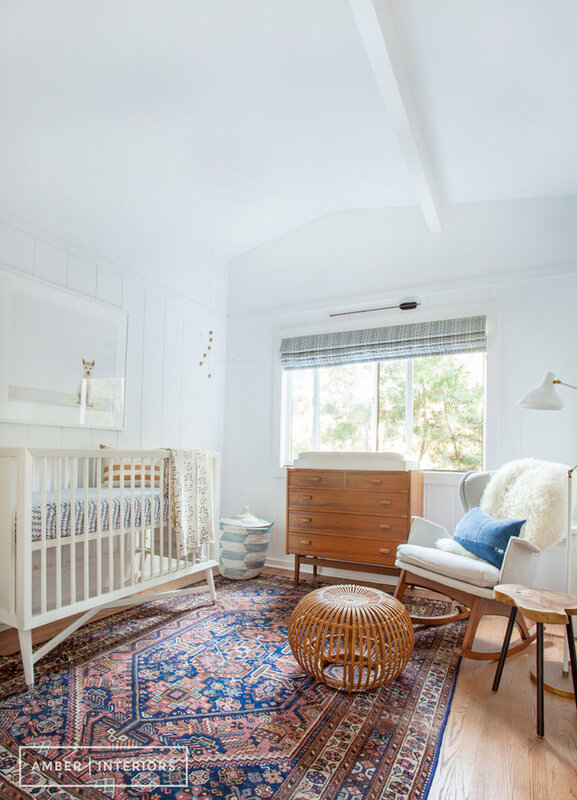 The bunting across the cot really sets a tone for the room and I love the fairy lights hanging off of the shelving, they add a touch of warmth and cosiness to the room – which is exactly how every baby or child’s room should feel. I love that the floors and walls are bright. 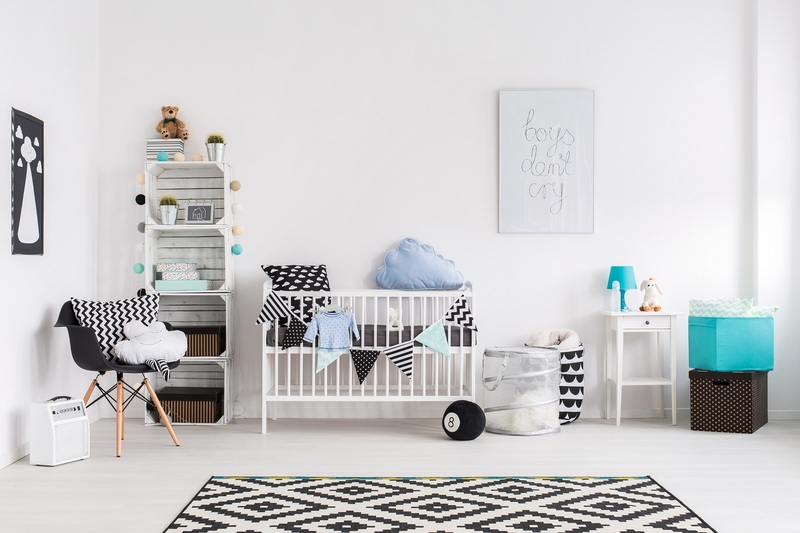 There’s a blue, white and grey theme which is fantastic because it suits a young baby as well as being grown up enough for a toddler. 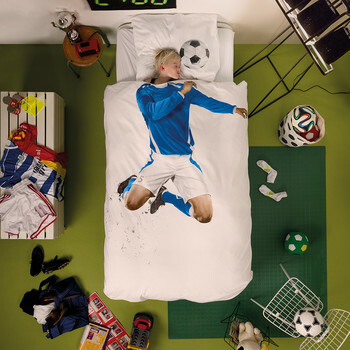 We’re re-doing our boys’ rooms this year and this image among others is where we’re taking inspiration from. I plan to use a light laminate floor like here and opt for light walls too, contrasting it by using colourful accessories. 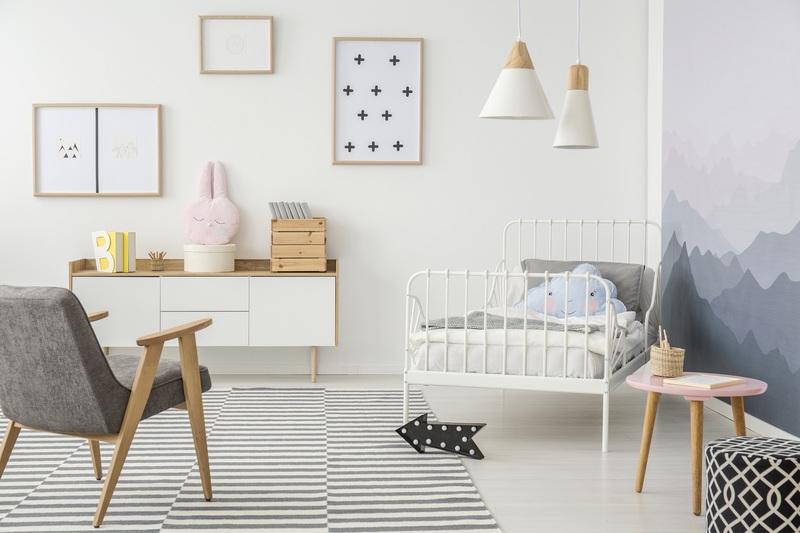 I think that when it comes to children’s interiors it’s fine to want to go modern, but it’s important to make sure that the room both reflects your child’s personality and is fun and young at the same time. 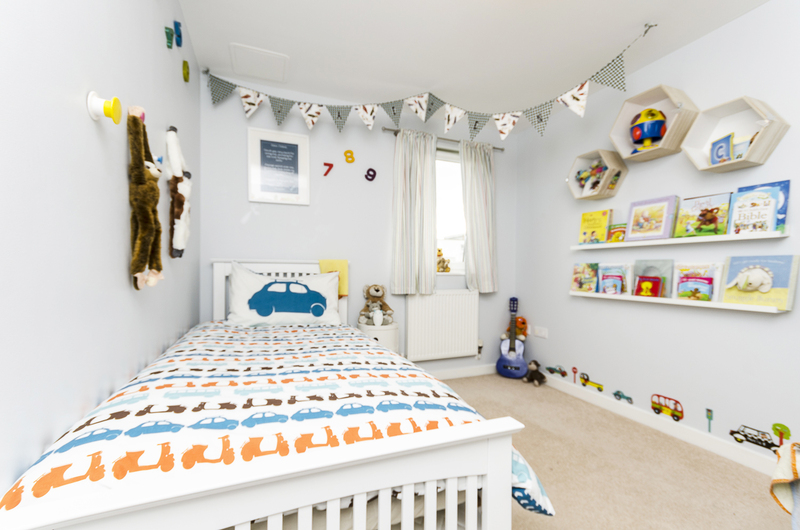 I adore a nursery that is simple, bright and happy – this space made me smile the second I spotted it. From the clean white walls (that can be easily touched up when the toddler years start! 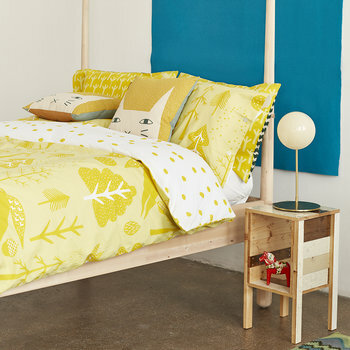 ), illustrations on the walls, to the cosy chair with a blanket for feeding or cuddles, it’s my idea of a gorgeous room. I love that modern style cabinet with it’s display of toys and fun artwork. It also offers a useful storage solution for all those little things that constantly need tidying away. 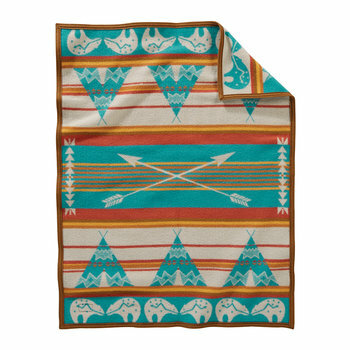 If I was going to be decorating a baby’s room again, this is a look I would be completely inspired by. 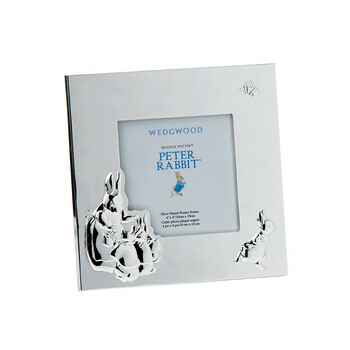 It’s perfect for a girl or a boy and a space that they can grow into too. The only thing I would be looking to add is something hanging from the ceiling. Babies love to look up, so a mobile or a garland would be great above the cot. 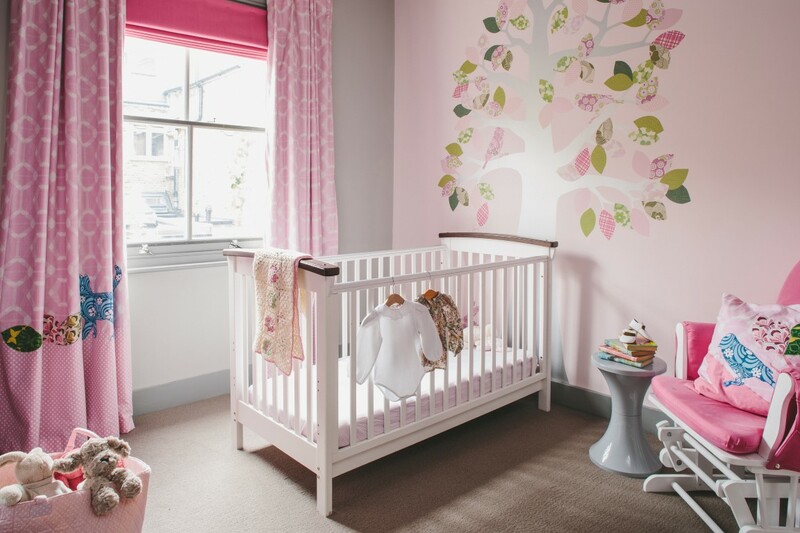 Kids are a great joy of family life, but one thing that can be difficult is decorating a bedroom of someone that grows so quickly before your eyes! I’m really big on gender neutral design and looking at this room, you wouldn’t be able to tell whether or not it belonged to a girl or a boy. It’s so bright and natural with bits of contemporary and Scandinavian design. Little elements like the blackboard, bean bags and lights are used to give the room a warm feeling even though the design is really simple. I love where the bed is placed in the corner by a large window too. 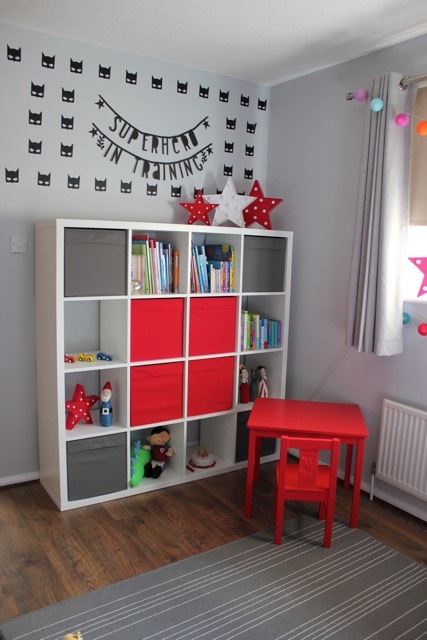 My top tip for decorating kids bedrooms is to maximise storage and to keep things simple, kids change their mind and get bored of a lot of things very quickly, we’ve all been there! 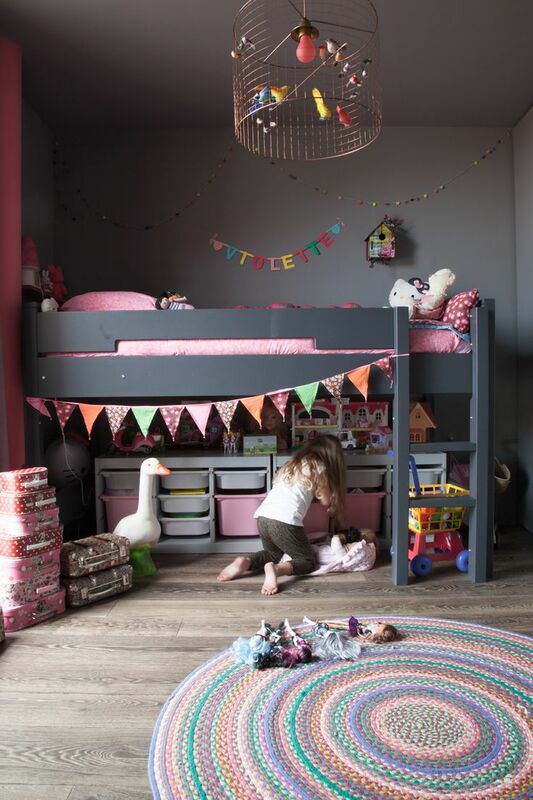 This girl’s bedroom designed features some must-haves for ultimate fun and style for little ones. Pastel colours are great in children’s bedrooms, mixing pastel colours makes it really easy to achieve a scheme that is soothing and still loads of fun. I love the pink and mint features that stand out in this bedroom! Next, the wall stickers are a great addition. They are easier, quicker and cheaper to use than wallpaper. Little dots, triangles or clouds are just some of the many choices available. 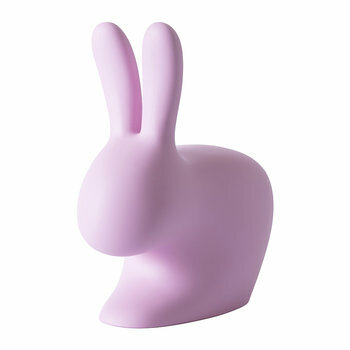 Making storage fun is also important by using a cleverly shaped side table. A dash of vintage, a sprinkle of whimsy and a drop of contemporary all seamlessly intertwined into this gorgeous kid’s room. The easy to reach storage space makes it easy to tidy up and keep things in their place. 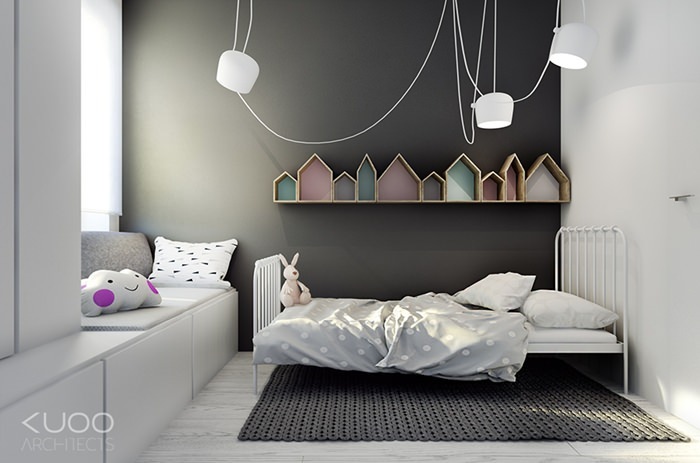 Plenty of floor space allows for freedom to move, play and imagine, and the bed frame creates a creative space within a space where dreams are made. The colours used are pleasant and the warmth of the light enhances the colours and softens the geometric lines of the mural and the carpet. 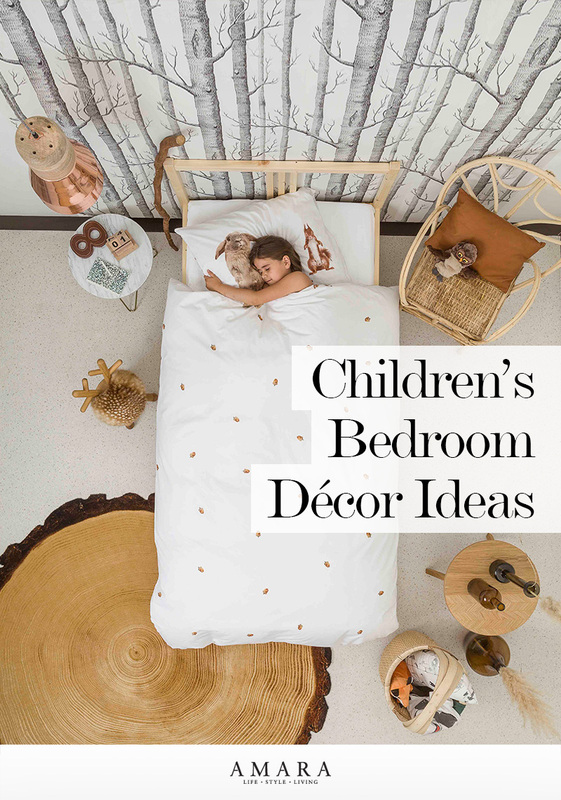 My tips for decorating a children’s bedroom would be to remember that fairy lights are not just for Christmas – use them in a child’s room to create a dreamy atmosphere and to not be afraid to mix vintage and contemporary styles. This bedroom was for pre-teen sisters who share a room in their family’s holiday home in Sandbanks, Poole. We wanted to create a fun, playful space, reflecting their hobbies and personalities – and the gorgeous coastal location. 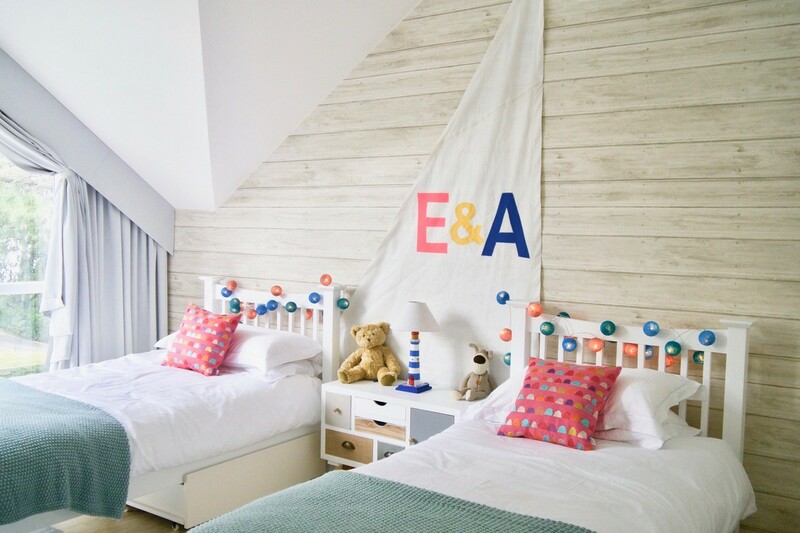 The sail personalised with their initials is quirky, and complements the Andrew Martin faux wood panel wallpaper, which is hung horizontally. The great thing about this room is the huge apex windows, which we dressed with simple grey curtains in a dim-out fabric, which will last for years to come. The room can easily be toned down as they girls mature, simply by swapping out cushions and accessories as their tastes evolve. A good desk is a must! This will be the centre point of a girl’s teen life! From homework and study to using as a dressing table, find a desk with drawer storage for books and supplies but also for hair care, a mirror and beauty essentials. Choosing a white desk option will suit any bedroom scheme, is low cost and easy to maintain. Personal space is so important as a teen, so add her own style in accessorising a funky chair design, a bright pattern blanket and some colourful desk tidies and that’s one cool combination of a desk and dressing table design! 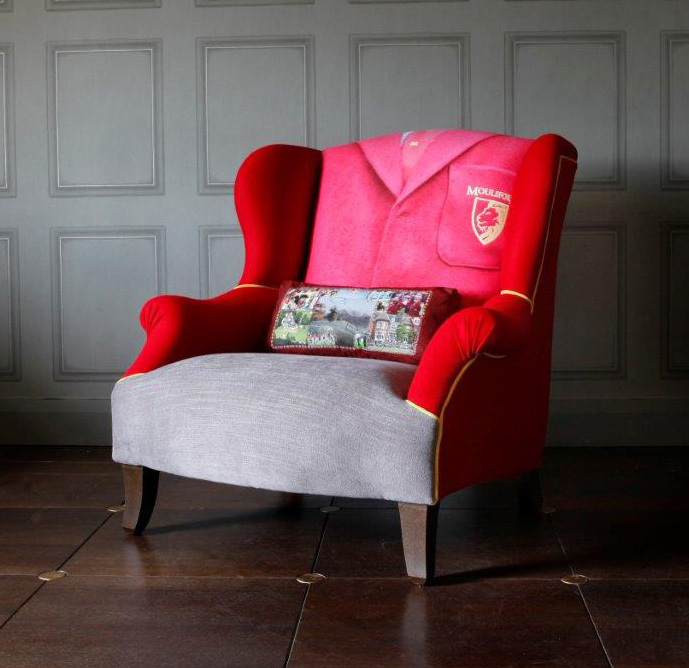 A school uniform chair would be a truly special feature for any child or teenager’s room – uniform, sports kit, brownies, cubs, a favourite party dress, any outfit can become an eye-catching piece of furniture with a little imagination. Here, I used a digital fabric design and combined it onto my favourite style of armchair. 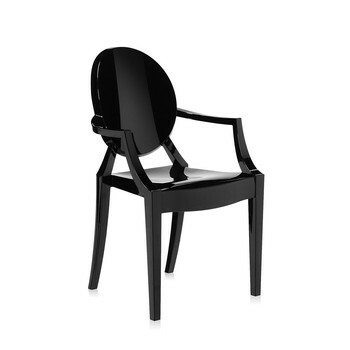 This would work equally well on any style of chair, sofa or interior furnishing! I think this is a wonderfully quirky design that features a fabulous twist on a special part of your child or teenager’s life, making sure that the memories of their happiest years live on forever… Custom-designed chairs, lampshades, cushions and wallpaper designs are a fantastic addition to any child’s bedroom and provide high quality, extremely comfortable pieces that will make your bedroom design truly unique and memorable. 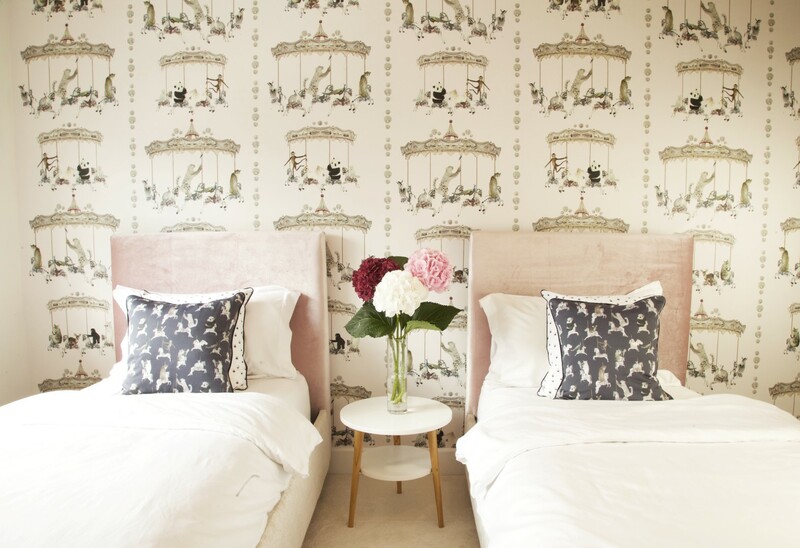 Which one of these stylish children’s bedrooms is your favourite? 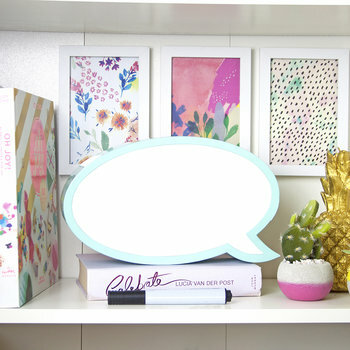 Pin the image below to ensure you’re never short of décor ideas for your little ones! Thanks for a beautiful post. Loved the treatment of Kids Room Wallpaper. Custom Wallpaper has changed the whole concept of kids room decor. Loved it. We’re loving the Rosie Kinsella room the most here. Where are the floral mini cases from do you know? Excellent post. Hi Katharine, glad to hear you liked the post! I’m afraid I’m not sure where the cases are from.. 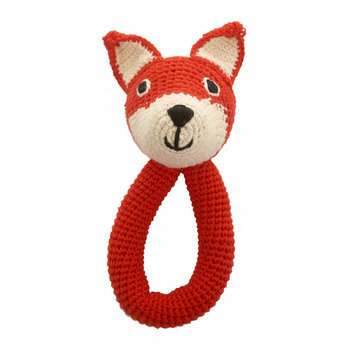 The image was taken from http://www.thesocialitefamily.com/ so it might be worth a look on there? Hmm, very good question – because they are all my favourite. But I prefer more rooms with bright colours, dark paints make me sad. I like the most Emma Green, Danielle Parisi, and Claire Price (love rock 🙂 ) interior designs. 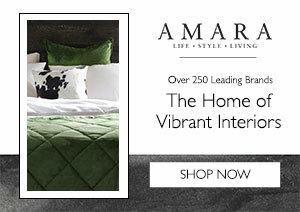 Can you share some ideas (maybe you have some designer links) how to make adults bedroom in different styles? This is such a great post! I was directed here from being totally clueless on how to decorate my sons’ room and I think I’m leaving here with something! Thank you for sharing! Could anyone tell me where the white changing unit/storage shelves in the top picture come from? Unfortunately there is no mention of the storage shelves in the post the image is originally featured in on Chalk Kids – I hope you manage to track down a unit similar soon! It’s great to hear that our article has been so inspiring to you and hope the decorating goes well! Hello there! 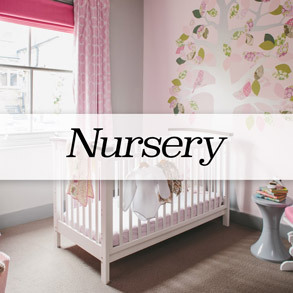 Nursery room ideas you share are all beautiful! Thank you! Oh gosh, these rooms are just stunning! My daughter has a little shabby chic nursery that was kitted out with Piccoli furniture, it never looks as tidy as these rooms though haha. Glad you liked them Charlotte! 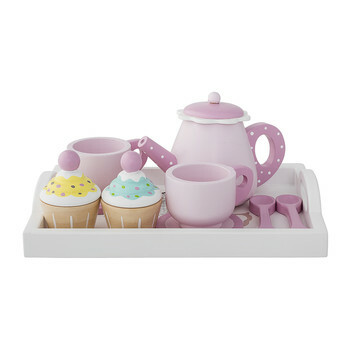 I know, keeping little ones’ rooms tidy is a constant struggle! Wow, some pretty nice decor idea here! What a wonderful looking room i see in the first picture. I want to do that kind of stuff for my kids, as well. WOW . . So much inspiration in one place. Just love all of these room ideas. Thanks for sharing. Am feeling inspired!! So many inspirational rooms. Will have to bookmark this for future reference. This is great. Thank you. Wow, great work! all inspiration and good advices! 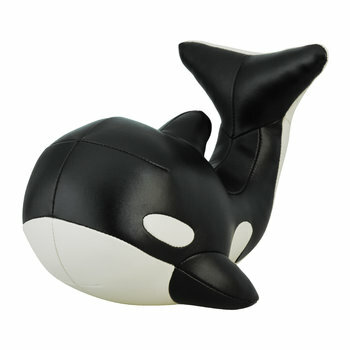 perfect decorating ideas for the room of the kids, you have helped me to get it, greetings. 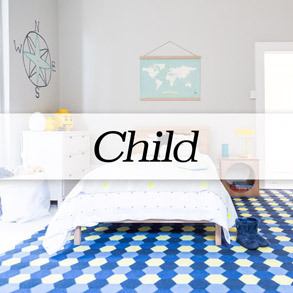 Hi Freddie Chatt, ” 27 Stylish ways to decorate your children’s bedroom” is beautiful article. Loved it. 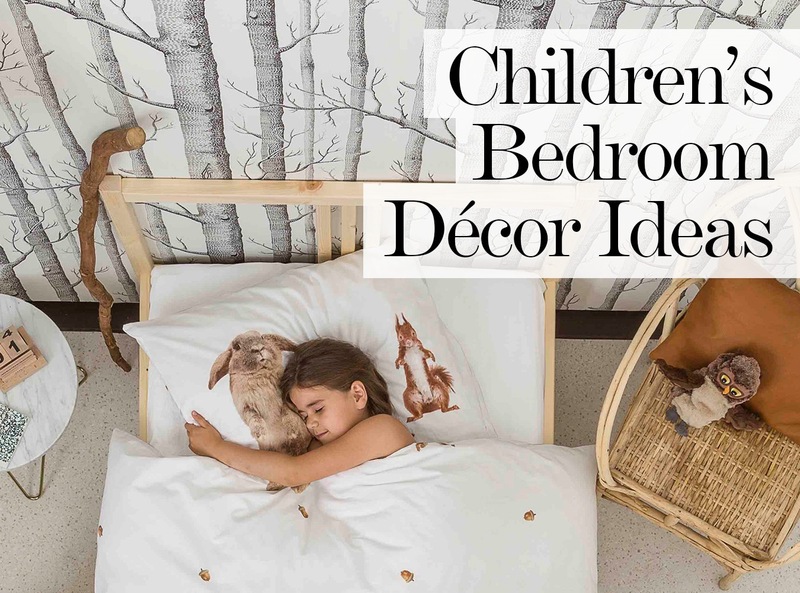 You gave so much ideas for children’s bedrooms that look so stylish and fun. Really enjoyed with pictures. Thanks a lot. Great… I must say a lot of attention is given to each and every minute detail. Any kid would love these kinds of rooms. My 10 yr old daughter’s room is being renovated. I will definitely use some of these designs. Wow, amazing though. I like this kids room idea. especially using multi-purpose storage ideas. I will help saving space in a small house. really clever ideas. 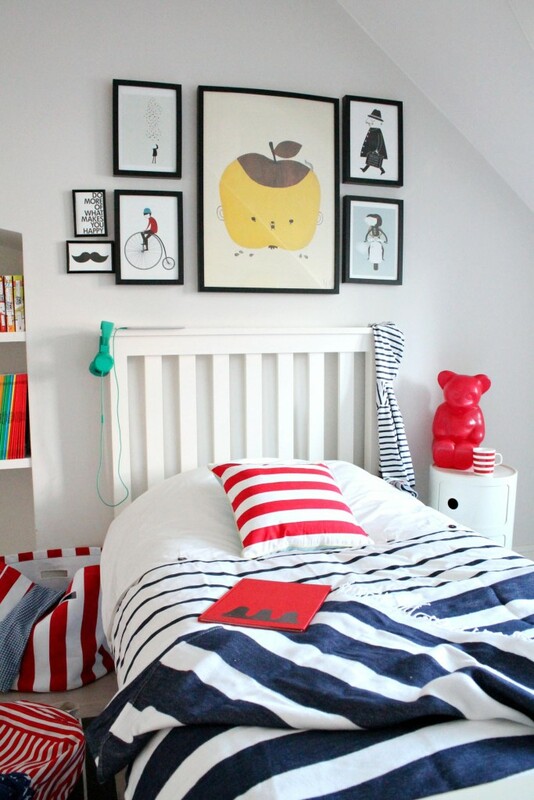 Nice design ideas for kids room so impressed thank you for the suggestion. I really love the ideas you gave in this post. I just can’t stand how cute those rooms are. Every piece of rug or toy looks so stylish and cool. Love your ideas. Stunning ideas. Where is the tree wallpaper from in the cover picture please. The wallpaper in the main image is the Woods design from Cole & Son. It’s lovely isn’t it? 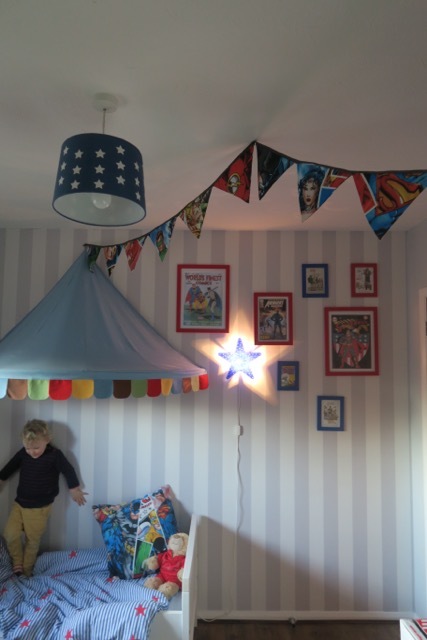 Fabulous Ideas for decorating the children rooms at their different ages. Great Insights from well known bloggers. Thanks for contributing this amazing article. Beautiful ideas! One of my daughters has to have everything in bright pink or lime green so the design by Lizzie Woodman fits here to a T.